Paying accomodation fees of £1,180 a term, students at Murray Edwards College have found themselves living in temporary ‘Bunkabins’ – cabins erected outside, on muddy ground. Due to ongoing renovations in their College, 15 students have been asked to wait until refurbished rooms become available, a deadline which has been extended on more than one occasion by the college. Originally, works on the College’s accommodation buildings was scheduled to be completed within just less than a month of the start of term, but in early October, students were informed that completion would be delayed until the 17th or 18th of November. This completion deadline was then, once again, extended, with an announcement last week suggesting that renovation could go on beyond the end of term. “Honestly, there is a very long list of problems, concerning the cold, the damp, and a lot of issues with noises”, second-year Law student Naomi Oldham told Varsity. “I’ve had people at like 10 p.m. scrape their keys along the side of my bunkabin for shits and giggles”, she added. “Some people find them bearable, but that’s honestly the most enthusiastic anyone feels about them”, Oldham said. Students were able to view pictures of the ‘Bunkabin’ rooms prior to choosing their accommodation in Easter Term, and were sent a document in February, which depicted gravel flooring outside, unlike the muddy reality, and offered only a flattering birds-eye view of the room. After disclaiming that she was one of the more positive ‘Bunkabin’ residents, second year medicine student Stephenie Yung said she was “pleasantly surprised” with her first impressions of the accommodation, which include a personal microwave, fridge and en-suite bathroom. She elaborated, however, that this was before “all the mini-problems” began to surface, including delays in building work, loud noise of rain on the flat metal roofs, and sodden conditions outside during heavier rain. Oldham described the en-suites as “honestly freezing”, while hot water has become less dependable throughout the term, with showers currently lasting around four minutes. One kitchen caters for all 15 students, and includes a boiling water tap which was not labelled at the beginning of term, causing one student to burn herself. Ten of the students living in the ‘Bunkabins’, including Yung, appear to have accepted their temporary living arrangements, and consider the possibility of moving out during term-time to alternative temporary accommodation to be too much of an inconvenience. Others, however, such as Oldham, say that they eagerly await any opportunity to move out. Both students said that the college promised to allow students to move if they found their accommodation to be unbearable, though there are currently not enough spare rooms for all 15 students to do so. Murray Edwards is not the only college this term which has seen students distressed with their accommodation facilities due to ongoing renovation projects. Last week, Varsity reported that renovations to Bodley’s Court have severely impacted living conditions for King’s students living in the building, with plastic sheets as windows offering little insulation, and large objects outside windows leaving little to no natural light. 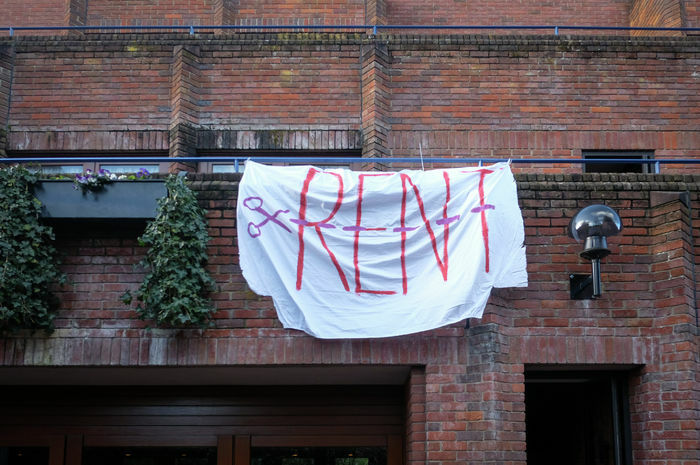 Students in the Bunkabins have also voiced frustration with rent costs. Though these are low in comparison with other Murray Edwards accommodation – currently between £1600 and £1900 a term – they remain relatively high. The college have agreed to ongoing negotiations on rent costs and have met with students twice, resulting in the removal of a £40 network charge and a further £250 from students’ invoices. However, the rent charges remain on a par with more well-equipped accommodation at other colleges such as at Trinity, where rents of around £1200 can provide a bedroom and sitting-room. Following a meeting with students, the College has now agreed that “a further reduction in rent would best be considered” after refurbishment has been completed, based on reports by students on the disruptions they have faced. Senior Tutor Kate Peters described consultation with students throughout the term as “extensive”, with the College “prioritising and dealing with any issues the students experience as swiftly as possible”. A spokesperson for Murray Edwards College told Varsity that the college was “sorry” that ten students will have an extended stay in the temporary accommodation, and has said that they are “committed to the welfare of its students”. They added that the college “will respond to further requests as they arise” from students after the adjustment of water temperature in a room last week. Activist group Cambridge Cut the Rent called the college’s concessions on ‘Bunkabin’ rent costs “a step in the right direction”, but that the college has failed to address “wider student concerns with the price of rent [and overhead charges] overall”, adding that “affordable, decent housing should not be up for debate”. “The college are trying their best to listen to us, and the senior tutor in particular has been great,” Oldham said. However, she added that “this is a situation which really should not have occurred in the first place” and that “issues will either get worse or pop up more often as it gets colder”, with the students’ stay in the Bunkabins currently expected to continue into winter.